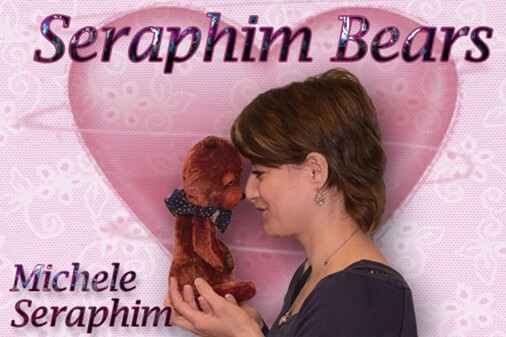 Michele Seraphim considers her time in bear making a love story. She's been in love with bears since her childhood, and has been working in fabric since she was old enough to hold a sewing needle. A winning figurative fabric artist and quilter, she has won competitions in Canada, where she currently resides in Belleville, and internationally. Michele shares her life with her husband of 10 years and two dogs, an Italian Greyhound and a Pug, along with two Siamese cats. "As I have no children of my own, through our pets I take pleasure in the joys of motherhood. My husband and I have been together for 10 years and have worked together all day since then. I am married to “my soul mate”. He is not only my husband and best friend but also a large part of my creative world. He often draws pictures for me of what I describe and from there I can see outside of my mind and try to achieve." Michele fills her days by working in the family wine and beer brewing business and by night, pursues her dreams as an aspiring bear artist. "No matter the day, no matter how much lifting I've done for the family business, no matter how tired I may be, I am called to my bears and find myself instantly relaxed and at peace," she says. Michele adds, "Plus, I like to think that all that heavy lifting gives me an excuse to eat chocolate." Prior to working for her husband's family, she was the head of the hair department for an International film school in Toronto. "I learned the art of wig making; hooking and styling there and graduated from beauty school in 1986. The skills I acquired in hairdressing have helped me tremendously with scissor sculpting. Scissors are just extensions of my fingers." Michele also ran a business with her husband for several years sculpting prosthetic monsters and special FX makeup for the film industry. "The knowledge of three dimensional sculptures was a helpful skill when it came to my art-dolls and taught me a lot about proportion. 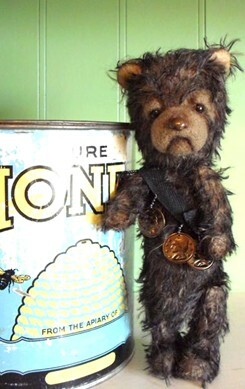 I have been able to merge all of these skills into my bear making and still I feel most drawn to the traditional vintage, well-loved bears best." 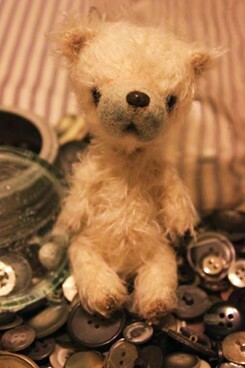 Bear making was a natural transition and possibly an inevitable destination for her. 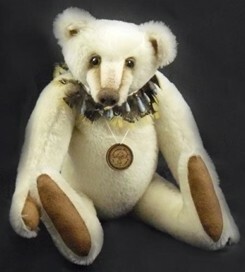 "I began making bears in 2008, primarily to make “one” bear for my grandmother, Mary, who started her bear making in the 1930’s in a British toy factory and continued to enjoy it for the rest of her life." "As you have probably guessed, one bear lead to two and two lead to three and the hug is still growing as fast as my fingers and my time will allow. 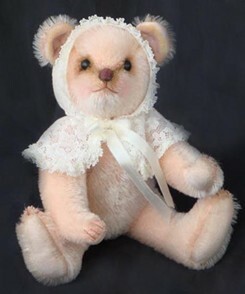 I have taken some online classes, read every bear book I could get my hands on, watched instructional DVD’s and by the end of 2008 started making my own bear patterns; creating a few contemporary patterns for my “melancholy” bears." 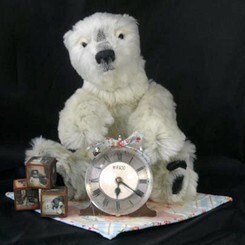 During the creation process, there is so much more than just “the bear” that is taken into consideration; the presentation of the adoption is all part of a delightful journey. 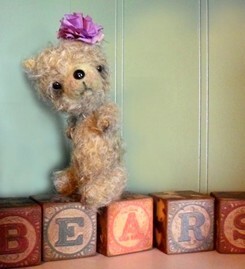 Meticulous about her art, Michele will rework a bear or pattern as many times as needed, until she is 100% happy. 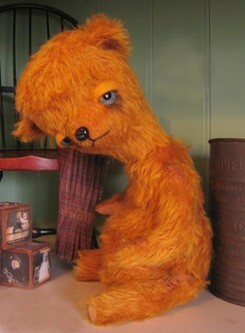 "A bear has been known to sit on my shelf for months in a state that others would call completed and yet one day it is un-stuffed, headless, or possibly armless and is back on my lap being redesigned. I get that happy feeling in my tummy, like butterflies dancing, when I reach the true completion and I know the bear is just right." "This is also when the final name is chosen for the bear. 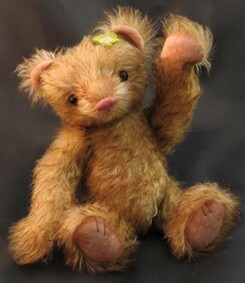 I always have a working name to start with but that name often changes once the bear has taken on its own personality. It is a really big celebration around here when the final name is picked." The bear is carried around for all to see and its name said for the first time out loud. "We roll it around in our mouths so we can feel it, all looking to one another for confirmation that this is indeed the right name. This is a really fun part for everyone in my family and it has become quite a tradition on slow days, for us to sit together and start writing down hundreds of names and I keep all the bits of papers." 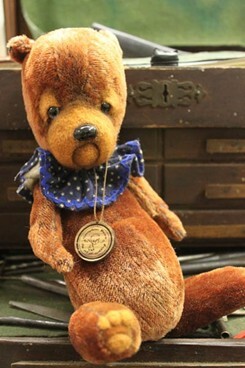 "What I strive for, no matter what style, is to make a beautiful bear. This is where my collectors really play a big part in my path as a bear artist. If I am making a certain style and I am constantly selling them and cannot keep up, that will more than likely become my style. This does not mean that I will not venture out as I feel that creativity needs variation to grow." 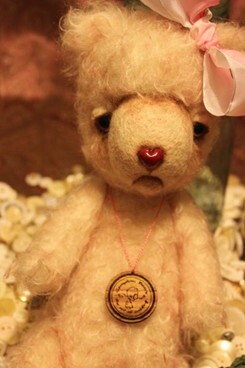 "There is nothing more sentimental to me than watching one of my bears leave my hug to enter into a new home. One of the most treasured parts of being a part of the bear community is the personal stories of how Seraphim Bears have touched the lives of the families who have adopted them. Bears have a way of touching the heart like no other and from the beginning I have kept a journal of each and every story with its corresponding bear. Thank you to all my collectors who have shared their stories with me - you have touched my heart." Although bears are now the main focus of her art, on occasion she still find time to quilt. "Last year I won first place for my Elvis art-quilt, which was displayed in Memphis during Elvis Week that commemorates the date of Elvis’s passing. I was lucky enough to travel to Graceland and enjoy the many festivities held in honour of the legendary artist who sang “Teddy Bear”." 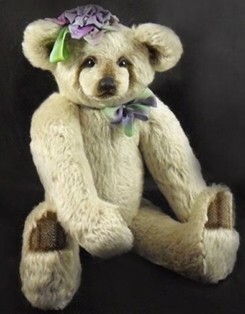 Michele sells her bears through her web site and through online auctions. She has recently started a blog to give back what the bear community has given to her. "It is my hope to bring you into my world, through this electronic medium, so that you can get to know me and my bears on a more personal level as you have shared so many touching stories with me." Michele is currently extending a hand towards those affected by the recent destructive earthquake in Haiti. One hundred percent of the proceeds from one of her current online auctions will be going to help those in need. It takes a lot of heart and a lot of skill to bring these little mohair creations in the world and Michele is bursting at the seams with both. You can find out more about Michele, her life and her works by visiting her web site.